"What you do is so difficult, but you keep going." 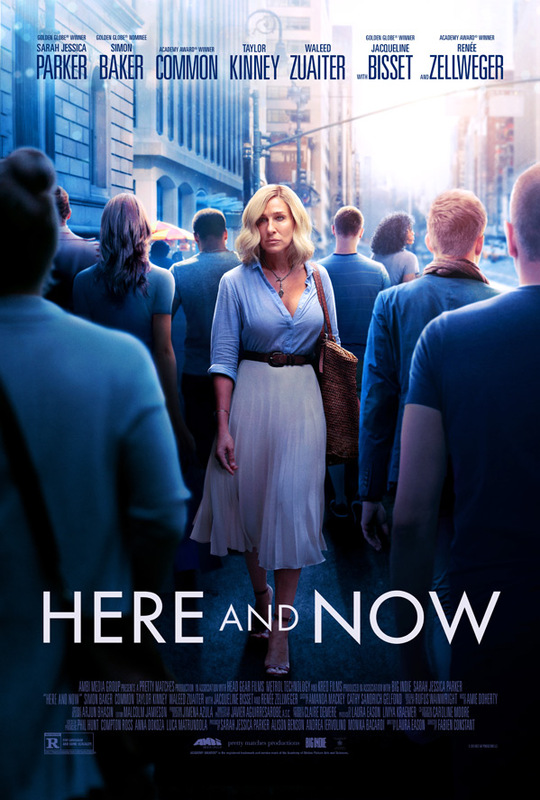 Ambi Distribution has released an official trailer for an indie, life-affirming drama titled Here and Now, which originally premiered at the Tribeca Film Festival earlier this year. The film stars Sarah Jessica Parker as a woman named Vivienne, an established singer / songwriter with a successful music career. On the eve of a major performance, Vivienne receives some life-altering news that causes her to reevaluate her priorities. As she traverses the busy streets of New York City, she tries to balance everything going on in her life and her new priorities. The film's cast includes Simon Baker, Common, Taylor Kinney, Waleed Zuaiter, with Jacqueline Bisset, and Renée Zellweger. It's not surprising that this look quite forgettable, and there's not much buzz about it from Tribeca anyway. Vivienne (Sarah Jessica Parker), is an established singer/songwriter with a successful music career. On the eve of a major performance, Vivienne receives some life-altering news that causes her to reevaluate her priorities. As she crisscrosses the busy streets of New York City, she tries to balance her upcoming music tour, family, and friends. With the support of her overbearing mother, Jeanne (Jacqueline Bisset), her long-time manager, Ben (Common), and her ex-husband, Nick (Simon Baker), Vivienne strives to make peace with the decisions and sacrifices she’s made along the way. Here & Now is directed by fashion filmmaker Fabien Constant, making his feature directorial debut after the fashion doc Mademoiselle C and a few other TV docs previously. The screenplay is written by Laura Eason. Ambi Distro. will release Constant's Here and Now in select theaters + on VOD starting November 9th this fall. Anyone interested?